Change is good, but for some it can be a daunting thing to accept. Recently at St. Thomas More Parish and Sacred Heart Parish respectively there was a change in Priestly duty assignments. With the retirement of Fr. Mel Taylor, rector of Sacred Heart Parish, both Parishes have been assigned Fr. Anselm Russell (who was appointed Pastor of St. Thomas More in October 2012), and Fr. 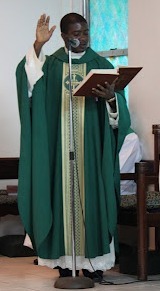 Jude Muokwe (associate pastor), a newly appointed Priest to the Diocese from Nigeria. It's no surprise that there would be mixed emotions about the amendments, however we must give thanks that each and every week we are fortunate to have a Priest at both Parishes. 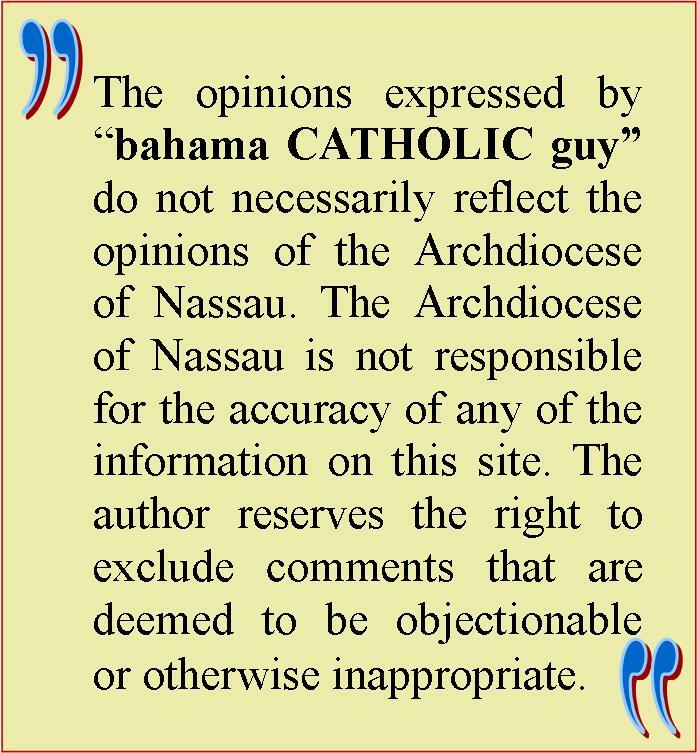 Let us not forget that there are many Parishes around The Bahamas and other Dioceses who do not see a Priest from one week to the next. This therefore leads me to the point I care to make with regards to our Priests; in that it is necessary that we make them feel appreciated and welcomed, especially those who are assigned to us from other countries. I've said it before and I will say it again, I do not consider Priestly duties and responsibilities as a job (such as being a plumber, carpenter, banker or lawyer), but rather a calling from God. Even those of us who are employed by a company expect some form of recognition to boost our spirits, so that we do not feel that what we are doing is in vain. So too should we share our time and gifts with our Priests. So where do we stand in comparison to the twelve disciples who were the original game changers in getting the message of Jesus to others including you and me? 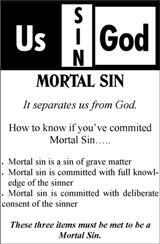 Isn't it just so easy to leave everything to our Priests who after all were 'called' to perform this task? This reminds me of a recent movie "A thousand words." The synopsis of the movie is about a young business professional who talked for a living. He talked so well that he would probably be able to sell ice to Eskimos. It just so happened that one day he tried to sign up this spiritual guru to use his company to publish his book. After stretching the truth on the deal, Jack McCall (played by Eddie Murphy) finds a Bodhi tree on his property. Its appearance holds a valuable lesson on the consequences of every word we speak. Each time he spoke a word a leaf would fall. The spiritual guru explained to Jack McCall that he would die when the last leaf fell. He decided that it was time to do good deeds in order to see if this would stop the leaves from falling. Did it stop? Or course not! Don't we find ourselves more inclined to do the work of God when the going gets tough for our lives? Why can't we just make it a point to start today. Is it that there is too much going on in our lives that we don't have the time to get involved with being an apostolate? We are all called by virtue of our Baptism to spread the good news of Christ, to touch the lives of each and everyone we come in contact with. As Fr. Jude reminded us; when we hear those words expressed by the Priest or Deacon: 'The Mass is ended, Go in Peace to Love and serve The Lord,' we are being told to go and share with others the message of Jesus. As a sacrament of Christ we are commissioned as were the disciples to evangelize to the world. There are many orders and groups within our Parishes who would welcome your assistance. Begin within your Parish and spread throughout the community the teachings of Jesus. Let us welcome and encourage our Priests for the work that they do. 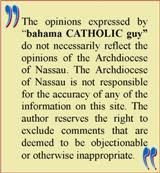 As a member of St. Thomas More Parish I believe I can speak for many when I say that we appreciate having Fr. Anselm as well as Fr. Jude who both come with different styles of preaching, that keeps us interested and intrigued to long for more of God's Word. Here below is Fr. Jude in action at St. Thomas More Parish on Saturday, July 14, 2012.